For breakfast, lunch, dinner, and even dessert, chicken eggs find their way onto plates around the world every single day. 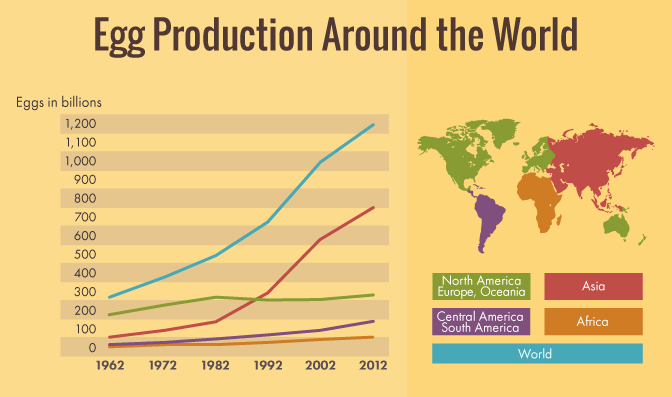 Despite cholesterol concerns and salmonella scares, egg production has been steadily increasing around the world – from 280 billion eggs in 1962 to 1.2 trillion eggs in 2012, according to the Food and Agriculture Organization. Adjusting for population and markets, consumption has doubled in 50 years, from about 90 eggs per person per year to over 180 today. Eggs are a trifecta in the kitchen – delicious, nutritious, and versatile. They provide flavor and structure to dishes, as well as bang-for-the-buck for thrifty consumers. Because eggs are such a mainstay in our diet, we should know what we’re eating. Luckily the easy-to-read nutrition label on the carton tells us just that! An average large raw egg (50 g) is approximately 76% water, 13% protein, 10% fat, <1% carbohydrates, and <1% ash. (Ash is the accumulation of inorganic components like vitamins and minerals, of which there are an impressive 21!) All that for a mere 70 calories! When eaten whole, eggs are very nutritious. So while you might prefer the taste and texture of either whites or yolks, eating both ensures you’ll maximize the vitamins, minerals, cholesterol, healthy fats, and protein that eggs have to offer. Eggs in most of North America are washed prior to packaging. This removes the protective cuticle on the outside of the shell and leaves them vulnerable to bacteria. That’s why they need to be refrigerated. Across the pond, however, eggs are typically unwashed and can remain at room temperature without concern. If you find yourself with washed eggs and no refrigeration, just grease them up with petroleum jelly. The petroleum jelly acts as the cuticle, creating a barrier that keeps bacteria out. 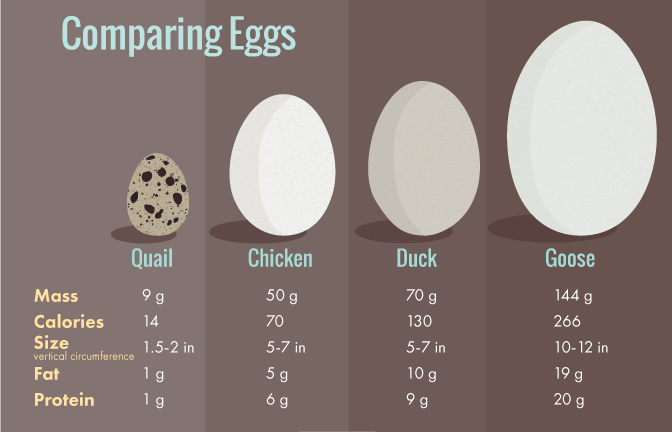 Eggs are classified by size, but also graded (AA, A, B) for quality based on their external and internal integrity. Grades have nothing to do with size, weight, or even freshness – just quality. 4) the air cell is no more than 1/8 inch deep. 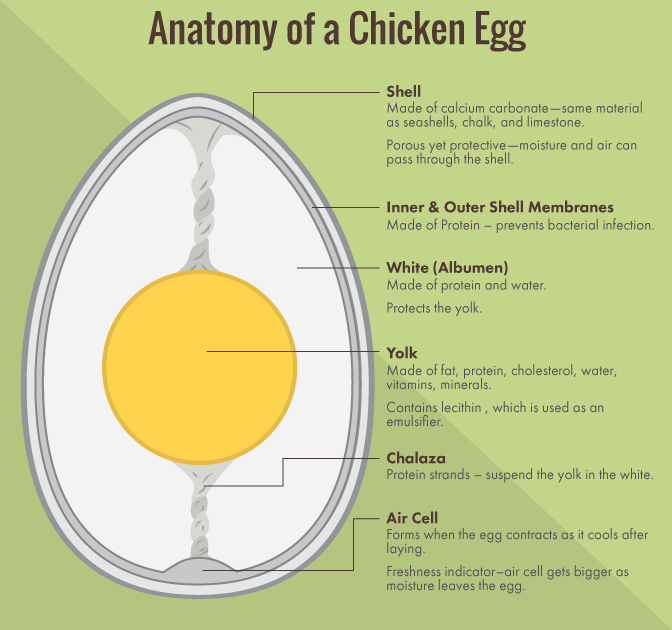 Now that we know all about eggs, we need to consider where they come from. You might say the grocery store, which is where most city dwellers get their pre-washed, stamped, and cozily packaged dozen, but let’s not forget where they really came from – a poultry farm. Recently, consumers have become much more concerned with the health of the chickens that produce their eggs – and rightly so. The macronutrients (carbohydrates/protein/fat) might be the same in a high-quality egg and a low-quality one, but the kind of fat and the quantity of nutrients and vitamins could differ greatly. High-quality eggs come from high-quality chickens. And healthy chickens, like humans, have a healthier diet and a healthier lifestyle. But what does that mean for a chicken? After all, we normally only see them on farms and in backyard coops. All breeds of chicken are a domesticated subspecies of the Red Junglefowl. But if they were to fend for themselves in the wild, what would they eat? As omnivores, chickens are quite resourceful. Their natural diet is whatever they can prod and peck from their surroundings – insects, seeds, fruits, and even mice and snakes. You might notice that some egg cartons boast vegetarian or grain fed, but this is far from their natural diet and is more related to disease prevention. Finding food in wide-open spaces allows chickens movement, natural behavior, and interaction with others, all making for healthy chickens that produce nutrient-rich eggs. It would be tricky to gather eggs from wild-roaming chickens, but many wonderful farms come close by giving their chickens ample space to roam, peck, and pester each other, while also providing shelter for egg laying. Eggs from these chickens are usually called pastured, pasture-raised, or free range. If you’re purchasing from a CSA box or at a farmers’ market, they’ll most likely be unlabeled. If you’re not so lucky to have a local supplier, you’ll have to learn your labels. 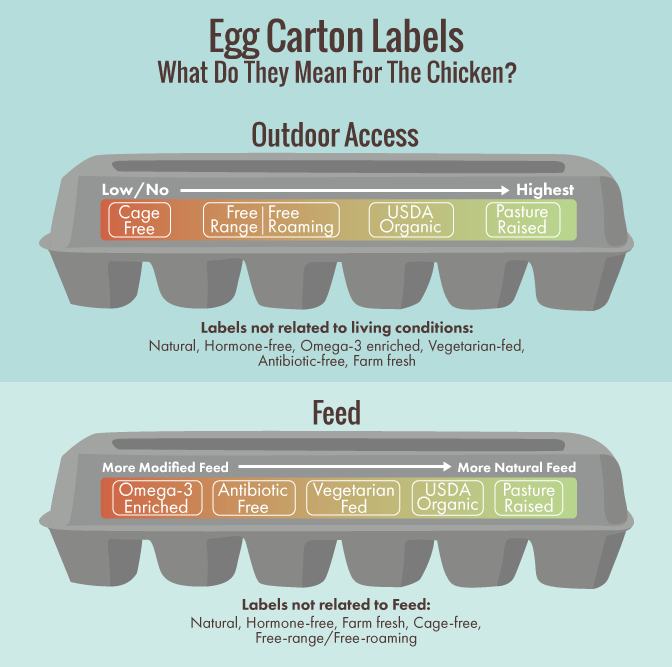 Egg carton labels usually fall into three categories: labels about living conditions, labels about feed, and labels from third parties that may or may not have anything to do with living conditions and feed. Why so many? Because while eggs have a wholesome, farm-fresh air about them, they’re a major industry. And the industry has largely unregulated labeling practices. Deciphering the marketing jargon on egg cartons is confusing and frustrating – some labels mean nothing, while others mean what they say. Battery cages are small cages, stacked on top of and next to one another, like the cells of a battery, minimizing the space requirements for housing livestock. Many of the eggs available at the supermarket come from chickens housed in these small cages. It is more profitable to place animals together in smaller spaces, but many people prefer to support producers who do not use battery cages, and allow the chickens a more natural existence. “Cage-free” and “free-range” mean the chickens do not live in cages, but rather in a large open room, with space to run around and move freely. It is clearly better than battery cages, although the chickens do not usually get to be outdoors. Unfortunately, increasing the food, space, daylight, and socialization requirements for the chickens will simultaneously increase costs for the producer. This is ultimately why there is a premium charged for cage-free and free-range product. And don’t be fooled: though “farm-fresh Omega-3 enriched” eggs sound healthy and wholesome, they probably come from caged chickens. If most labels are unregulated marketing ploys, what’s a consumer to do? Well, there are a few labels that are regulated, informative, and reliable because they encompass both diet and living conditions. Look for reputable organizations (USDA, The Humane Society) and ignore the rest of the clutter. If traceability is extremely important to you, the best option is to find a local farmer who can supply you with actual farm-fresh eggs. They may be brown, white, or speckled and come with a bit of dirt on the shell, but they’re as good as it gets. And if you can find a supplier nearby, why not try duck, quail, goose, turkey, pheasant, or even ostrich eggs? All differ in flavor, but have the same basic nutrition. They’re also more likely to come from birds raised on a less industrial scale. Choosing eggs should be easy, and it is. Keep it fresh by keeping it simple. Instead of wasting time agonizing over egg carton labels in front of the supermarket cooler, look for the labels you trust or take a trip to the farmer’s market and get your delectable dozen (and some peace of mind) straight from a local farmer.